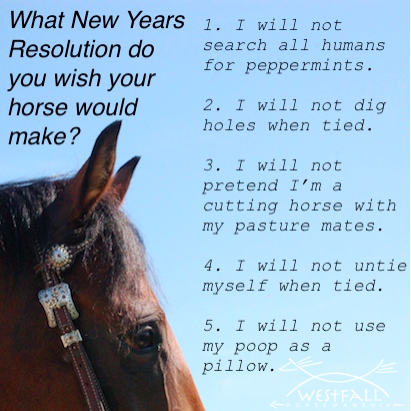 What New Years Resolution do you wish your horse would make? The little Welsh gelding: I will NOT poop under the run in shelter when there’s an entire field to fertilize. The little Welsh Mare: I will perfect the low, soft nicker to encourage more double feedings when mom thinks dad hasn’t fed me and vice versa. Giggles… thank you for the laugh… Happy New Year. I will not untie myself when tied 🙂 I will not think tumbleweeds are flying witches coming to cast spells on me. 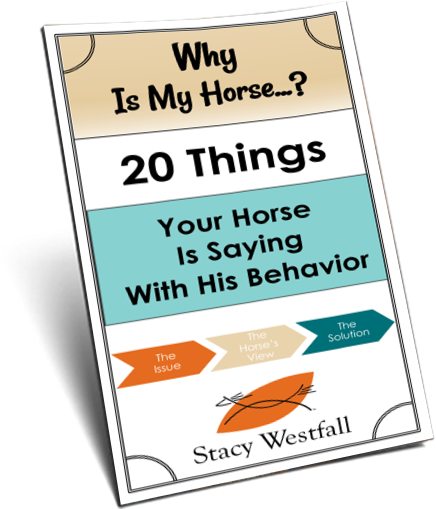 1) I will not poop on my neighbor’s driveway when I ride by. 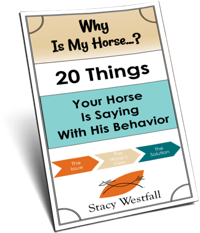 2) I will not throw a fit when my pasture mate gets to go for a ride and I have to stay home. 3) I will not eat my owner’s Mom’s raspberry plants. 4) I will not eat the rest of the garden, plants, trees, etc. 5) I will not bite my pasture mate or kick her in the head. How ’bout “I will not poop in my water bucket!” 😉 Happy New Year!